After installing SEO Yoast in your WordPress theme it will simply read as WordPress SEO, and you will see a new item in your sidebar simply labeled SEO. 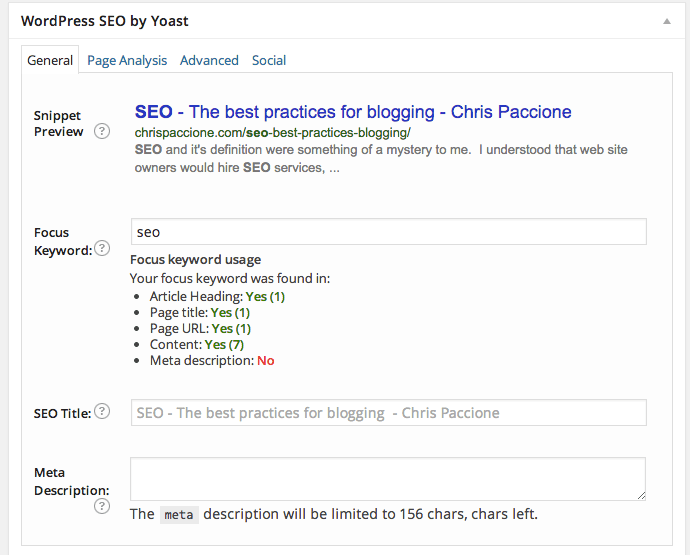 Yoast SEO in the admin panel of WordPress. I underlined it in green. There are a few tutorials on YouTube that will show you in detail how to set up the Yoast plugin, and I will link to a video at the bottom of the blog post, but for now I want to focus on the checklist to give your post the Yoast green light. 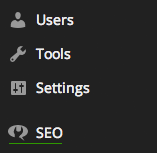 When you login into your WordPress admin and begin your post, you will notice you have a new panel which is below the post called “WordPress SEO by Yoast”. The first step is to enter a focus keyword for your blog. The focus keyword will allow you to run a page analysis once you save your draft. After saving the draft, you’ll see a preview of what you already have on the SEO checklist, and the page analysis tab will allow a more detailed view, and tell you what you still need to add to optimize the post. Here is a screenshot of what the panel will look like below your post. 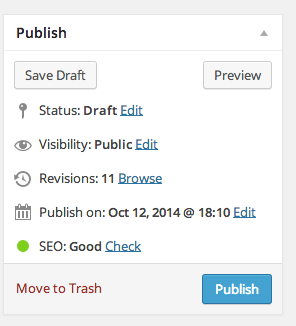 Yoast SEO Panel which will show below all posts and pages once the plugin is installed. Once you add the focus keyword of the blog post you will also notice in the upper right hand corner of your admin panel, a red “check” circle that will advance to green as you optimize the post or page. The circle will be grey until you add the focus keyword. Here is a quick checklist that will help you optimize your blog post. The keyword is in the title of the post. The keyword is in the slug (you can edit the slug for SEO optimization if you’re using the Post Name setting for permalinks in your WordPress theme). Subheadings, it’s very important to include at least one subheading H2 tag, and include the focus word of your blog. More is better in this case, but one is sufficient. Your blog post has a minimum of 300 words. The keyword appears in the first paragraph of your post. I hope these guidelines help you optimize your posts for SEO, and below I will link to a tutorial on how to set up Yoast SEO on your WordPress site.